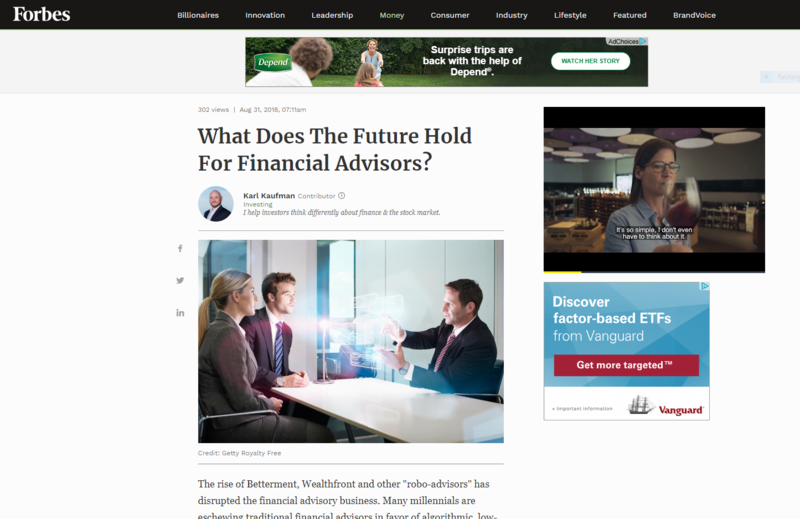 What Does The Future Hold For Financial Advisors? The rise of Betterment, Wealthfront and other “robo-advisors” has disrupted the financial advisory business. Many millennials are eschewing traditional financial advisors in favor of algorithmic, low-cost alternatives to managing their money. As Baby Boomers continue to age, the trillions of dollars in wealth they’ve accumulated will flow down to younger generations. Are financial advisors concerned about losing clients amidst the increased competition from robo-advisors? What advice would they give to a young financial advisor who’s just getting started in the industry? What does the future hold for financial advisors? Read more: What Does The Future Hold For Financial Advisors? Helpful financial information and tips delivered straight to your inbox. This communication is strictly intended for individuals residing in the states of AL, AZ, AR, CA, CO, CT, FL, GA, ID, IN, KY, MD, MA, MI, MN, MT, NJ, NY, NC, OH, PA, PR, SC, TN, TX, WA and WI. No offers may be made or accepted from any resident outside these states due to various state regulations and registration requirements regarding investment products and services. Securities and advisory services offered through Commonwealth Financial Network®. Member FINRA, SIPC , a Registered Investment Adviser. Fixed insurance products and services offered through CES Insurance Agency or Oaktree Financial Advisors, Inc. Tax services offered by Oaktree Financial Advisors are separate and unrelated to Commonwealth. Oaktree Financial Advisors, Inc. is not affiliated with or endorsed by Eli Lilly.